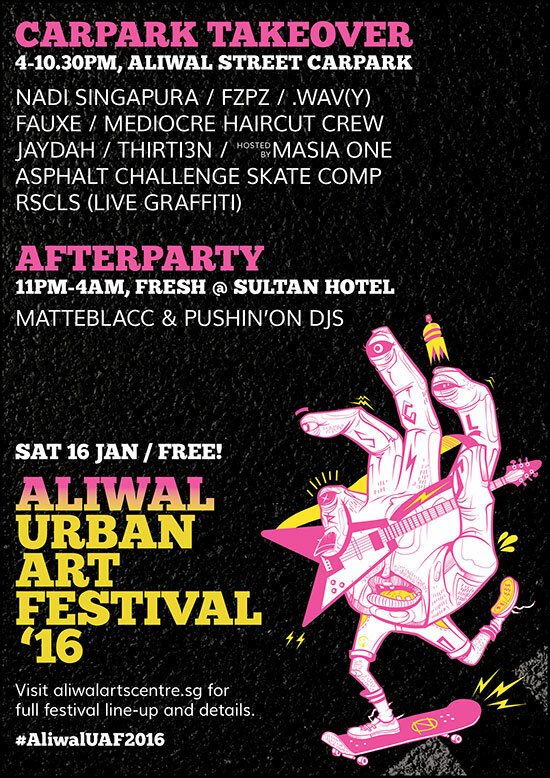 Experience the sights and sounds of the Singapore underground at the 3rd annual Aliwal Urban Art Festival! This year we’re taking over the carpark to showcase sounds by Fauxe, Mediocre Haircut Crew, FZPZ, Jaydah, .Wav(y), THIRTI3N, plus live graffiti by RSCLS and THE ASPHALT CHALLENGE SKATE COMP organised by Skate SG. Throw in a late night afterparty with Matteblacc and Pushin’On DJs at Fresh at Sultan Hotel and you’ve got 12 hours of bangin beats and good vibes – all for free! – Live music from Cesspit, Dru Chen, Take Two, The A Cappella Society, What Is Hip?